Information and Facts About the Island of Fernando de Noronha. All you need to know about Fernando de Noronha paradise island. Maps, Information and tips from local Noronha Experts. Fernando de Noronha lies in the Atlantic Ocean approximately 220 miles off the Brazilian coast. This archipelago consists of 21 islands, including one main island that is 7 sq. miles, with a population of just over 3,000. 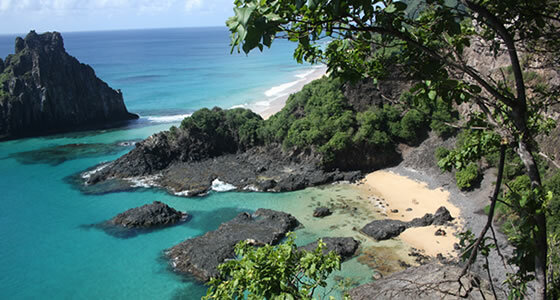 Fernando de Noronha has been named a UNESCO World Heritage Site. Since the islands are so small and fragile a maximum of only 460 tourists are allowed at a time. There is also an Environmental Preservation Tax that is more expensive the longer you stay. This is a tropical climate consisting of the rainy and the dry season. The rains fall from March through September, so summer is dry and winter is very wet. These islands are the peaks of an underwater mountain range. The main island is around 6 miles long and 2 miles wide. This island used to be covered by a large forest but the trees were removed to keep prisoners from building escape rafts. Most of the island is now covered by shrubs. There are two birds native to the island as well as an indigenous rodent that is now considered extinct. The main attraction at this island is the sea life including dolphins, manta rays, sharks, eels, giant groupers and sea turtles. There are reefs surrounding the islands with indigenous fish found no where else in the world. The water currents coming from Africa keep the waters sparkling and clear. Visibility is up to 50 meters and the waters are quite warm. This archipelago is also home to major sea bird colonies including the albatross. There is only 1 circuitous road on the mainland that connects to all important sites. Buggies can be rented but the easiest way to travel is by public bus. Hitchhiking is another popular mode of transportation and fairly safe way to travel. However, if you choose to hitchhike it would be wise to learn some Portuguese so you can tell your transport benefactor where you wish to be let off. Of course there is nothing more beautiful than the sunset and views are perfect all over the islands. The most beautiful beaches are Sancho Bay and Pig Bay and visitors are encouraged to experience both. Travel to Dolphin Bay to see the dolphins and Sueste Bay to spend some time with the sea turtles. The main reason most guests come to the island is to enjoy one of the many beaches that surround the island. But there is plenty more to do. There are boat tours, scuba diving expeditions, dolphin watching, kayaking and snorkeling. Surfers come to Fernando de Noronha as the waves are some of the best in Brazil. For those travelers who prefer to stay on land there are many hiking trails in National Marine Reserve. The island houses approximately 70 pousadas and 1 hotel. The lodgings are rated by one, two or three dolphins instead of stars. Most of the pousadas offer breakfast with the standard rate and guests can expect to dine on delicious local fruit including acai and bananas as well as granola. All pousadas offer free wireless Internet and you will be sure to find a hammock or two on the grounds.